Metropolitan Touring's 40-passenger Isabella II is an expedition yacht offering year-round cruises in the Galapagos Islands. The former supply ship was built in 1979 and reconstructed for Metropolitan Touring in 1988. Like its sisters, the ship is regularly refreshed; the most recent dry-dock occurred in June 2018 when the reception area, dining room, cabins and bar lounge all enjoyed a refresh. Cruise fare: what's included. The cost of the cruise includes excursions (island treks, snorkeling, kayaking, etc. ), all meals and snacks, lectures and snorkeling equipment (masks, fins, snorkel). Three-millimeter "shortie" wetsuits, which are recommended during the June/July to December cool season, can be rented onboard. Wi-Fi, which is available in Isabella II's lounge and small library, and sodas/adult beverages are also extra. Expedition essentials. 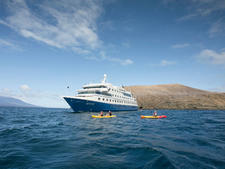 Passengers cruise with one expedition leader and two naturalist guides. Other expedition accouterments found on Isabella II include sit-on-top sea kayaks, a glass-bottom boat, and three "pangas," the omnipresent water taxis that facilitate ship-to-shore transportation in the Galapagos. A doctor is also stationed permanently onboard should passengers run into any minor issues with the equatorial sun, wasps or seasickness. Cabins. Isabella II features 18 139-square-foot inside cabins (Classic), one 128-square-foot inside cabin (Standard) and one 170-square-foot Master Suite Cabin with picture window. 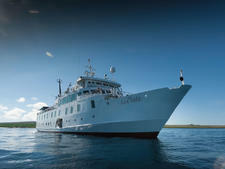 (These snug accommodations are par for the course in expedition cruising.) There is some variation in cabin configuration; the Classic cabins feature either fixed twin(ish) beds that run parallel or fixed twin(ish) and singles that form an "L." The one Standard features a twin-sized bed, and the Master Suite has a queen. Cabins amenities include hair dryers, telephones, safes and 110-volt, U.S.-style outlets. Dining. Breakfast, lunch and dinner are served open seating at designated times in Isabella II's dining room. Breakfast and lunch are buffet-style while dinner is served course-by-course. The occasional meal is also served alfresco on a top-ship (covered) secondary venue. Post-excursion snacks (juice and pigs 'n blankets, say) are offered daily. Public spaces. The social hub of the yacht is the comb bar-lecture room, which is used for evening briefings, video presentations and as a destination before-and-after dinner drinks. An adjacent mini-library houses a pair of Web-ready computers and a collection of books about South America, the Galapagos and wildlife. (Wi-Fi is available in the library and bar/lecture room.) Isabella II's lobby features a small boutique selling logo hats, shirts and jackets, as well as a variety of travel essentials for forgetful passengers (sun block, aloe, sunglasses). An exercise room contains a bike, elliptical and treadmill. The yacht's sun deck features a smattering of wicker loungers and a jacuzzi with room to comfortably accommodate six passengers. The 2002-built Santa Cruz II is a replacement for the much-loved Santa Cruz, which plied the waters of the Galapagos for 36 years.